ALTA's 2018 scholars are, from left, Brandon Banke, Rebekah Bobo, Cameron Raj and Neal Seymour. 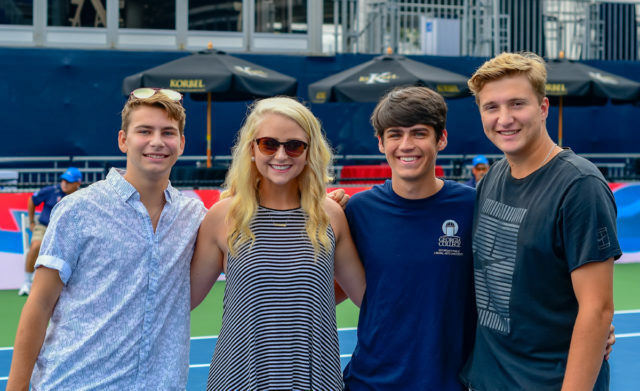 Our 2018 L. Keith Wood Scholarship winners share a common pedigree: Each is smart, personable, charitable and passionate about tennis. The winners of $5,000 scholarships – funded by an endowment from a former ALTA president and chairman of the board – were recognized center-court on ALTA Day at the BB&T Atlanta Open in July. As a youngster, Brandon Banke dabbled in a number of hobbies and sports, trying to find his niche. “I had tried every sport – football, soccer, baseball, gymnastics – you name it,” he said. 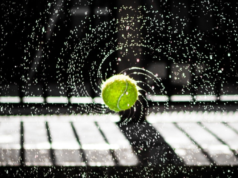 It took a friend’s invitation to try tennis to help him discover his thing. He finds it amusing now that his mother was a tennis player back then and had encouraged him repeatedly to try it. Now he is on a Mixed Doubles team with her. “I am making memories I will hold on to forever,” he said. He also played on Junior ALTA teams (even winning City Finals) and on the school team at Alpharetta High School. “I have learned to be a humble winner and how to find the determination within myself to keep trying after a tough loss,” Banke said. Banke is a student at the University of Georgia, studying environmental engineering. He plans to keep playing tennis at the club level. It’s hard to imagine that Rebekah Bobo has time for tennis given her full volunteer schedule. Her roster of charities includes Woodstock City Church, MUST Ministries, Habitat for Humanity, YoungLife, Key Club and Fellowship of Christian Athletes. In high school, she shadowed speech therapists at local elementary and high schools. And she worked two part-time jobs and occasionally babysat. But she also loves sports and excelled at many, including basketball, softball, volleyball, soccer, even football. But tennis … that was special. Bobo played on ALTA Junior teams and on her school team at Sequoyah High School. Now she is studying speech therapy at the University of Tennessee-Knoxville. Tennis taught Dunwoody High School graduate Cameron Raj the character trait of “stick-to-it-ive-ness.” He played Junior ALTA and joined his junior varsity team in eighth grade. But he dreamed of being on varsity. After three days of tryouts, he eagerly scanned the team roster on his coach’s door. He wasn’t on it. “At first, I was angry, but I soon realized I would have to put in twice the work to make it the next year.” You guessed it; his name was on the list. 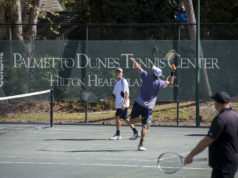 In addition to team tennis, he helped teach tennis to special education students during his school’s tennis day. And he and a high school teammate figured out a way to turn their sport into a business. “We ran a tennis camp for young players in my neighborhood,” Raj said. “I’ve always liked business,” he added, which is why he will study marketing or accounting at Georgia College. Neal Seymour likes to credit tennis for his very existence. “My parents met on the tennis court,” he said. “So you could say that without tennis, I might not be around.” The Pope High School graduate is now a student at Kennesaw State University, where he will study architecture. Seymour tried tennis at his parents’ request; he kept at it on his own. “I liked it because it kept me outside,” he said. He played on his high school team, on ALTA’s Junior Challenge Ladder and is an assistant tennis coach at East Cobb Swim & Tennis.